My surgeon suggested I lose another 10 kilos before we do the tummy tuck. It‘ll benefit so much: the surgery, the results, the recovery. I enthusiastically agreed … just 10?! Easy … until I realized that 10 kilos is 22 pounds. That’ll get me to the weight I was on my wedding day, and into the healthy green BMI range for my height … a first in YEARS. (There is no mercy for us shorties!!) This will definitely tone me up. And most importantly, dropping those pounds will minimize whatever visceral fat is still hanging around my core, and that’s definitely a good thing. But, ughhhh … the work involved. Getting to THIS size and shape took work! Maintaining isn’t too bad. But to keep pushing that dial down …. it’s going to take more discipline. I spent today charting out a new routine and meal plan, factoring in family/work, school (which just started up again), travel plans, and the breast lift, which will be done first this spring. I start this ”new“ effort tomorrow. Thank you ahead of time for NOT offering me Girl Scout cookies, or a GNO at the wine bar, but instead inviting me out for a run, or walk, or offering to time my planks for me. The support is everything. 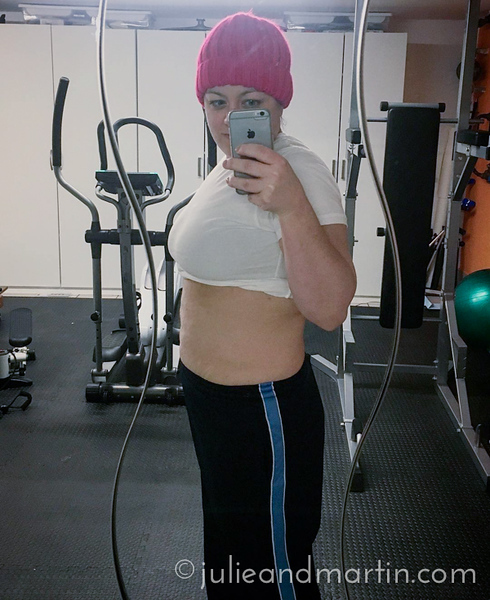 And by the way, this is my “before” photo, taken this evening … I’m very proud of this weight and shape. I didn’t think I could get here, but I did. So let’s keep going!